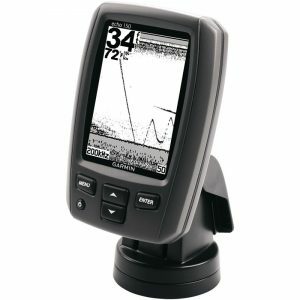 The Garmin echo 150 Dual-Beam Fishfinder is simply an amazing bargain. If you’re not turned off by the smaller, black and white display what you’ll end up with is a surprisingly powerful unit that can make all the difference when you’re on the water. This one isn’t for the professional, but in the hands of a novice it can give them the edge they need to make sure they reach their limit for the day. This Garmin finder comes with a black and white display. While it’s not as primitive as the old LCD displays, there’s a lot of color options available even for those on a budget anymore. The screen itself is 4” diagonally and has a modest resolution of 160×265. It’s not a complete deal breaker, but those looking for razor sharp resolutions and brilliant colors would be best off looking elsewhere. The Garmin Echo 150 has a surprising amount of power for such a cheap unit, with the different varieties being able to read up to 1500’ in depth. The standard transducer is a 77/200 kHz model, so it’s fairly moderate in that capacity. It’s not going to map the Marianna Trench anytime soon, but it’s definitely robust enough for nearshore and lake fishing applications. The Dual-Beam technology comes in as a welcome surprise, though. You’ll receive readings from both frequencies at the same time, allowing you to have access to quite a bit of information simultaneously. The more information you have at your fingertips, the easier it will be to make educated decisions about where and when to cast. That said, it lacks the more advanced capabilities that will come with one of Garmin’s more expensive units like DownVu and CHIRP. It’s no slouch in the standard sonar findings, though, and it will give accurate and fairly complete readings. This unit is pretty no-frills. There’s no GPS or networking capabilities available. The only thing it really has going for it as far as additional features are the normal gauges for temperature and speed. This is where the Garmin Echo 150 really shines, and it’s actually primarily due to the lack of other options. Even a complete newbie will be able to quickly and easily use this finder, there’s not a whole lot to it. It’s also remarkably compact, making for a unit that can be used by almost anyone. Once you have the easy-to-install mount on your vessel, you’re ready to begin. This kind of plug-and-play installation and lack of extraneous features makes the Echo 150 an extremely pragmatic choice. There’s almost no learning curve to getting your readings here, as long as your transducer is mounted properly you’ll receive the data you’re looking for. There aren’t many fish finders available that will be as easy to use as this one. Professional anglers will probably want to look elsewhere, as will even those participating in small-scale tournaments. However, the small size and ease of use make this a great option for those who haven’t used a fish finder before. The investment is tiny for the sheer amount of value you’ll receive while using it, and it makes a great buy for the angler who just wants to find out if fish finders are really worth all the hype. Can you tell me how to get out of display mode.